How funny, thanks for the article. The decree also provides for free sterilization surgeries to encourage Argentines to have their pets spayed and neutered. But many Argentines are uncomfortable with the practice, and only 14 percent of owners said they had neutered their pets in the study by Millward Brown. THESE NUMBERS are horrible!!! It's the same in the USA, people feel "uncomfortable" spaying and neutering....really?? How about you go watch while they euthanize a healthy unwanted animal....talk about uncomfortable!! I just got a copy of my local Animal Shelters rates. They killed 2,780 kittens in one year... KITTENS. This is just one "shelter" ...the total they killed was 10,088. Imagine when you multiply times each shelter, each county....ugh...when will this ugliness end!?? 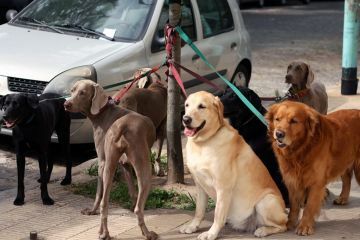 While I think it is great that dogs are so pampered Walking with 15-20 other dogs on leashes does not sound pleasant. Maybe I just don't like crowds but they don't get to stop or sniff, they have to hustled along with many other dogs. That does not sound like much fun for them. Argentina most definately must lift their rates of spay and neuter as 14% is dreadful.Dogs and cats being euthanized is disgraceful and this is frequently the outcome of selfish peoples failure to desex thier pets. Seems like they're becoming more like Americans and adopting our ways of treating our pets. It's not unusual to see dog walkers in NYC walking more than 10 dogs at a time. We also have doggy daycare and pet spas with waiting lists. It's always a good sign when people treat their pets well. So many animals die every year because there are not enough homes for them, very sad. All nations should honor and respect their animals and treasure them. They are gifts and not to be eaten, used for entertainment or for research.